Workhouse Union operates out of a wing of Callan Workhouse, where we have an office, research room and library. Within our building, we share facilities with artist Ciaran Murphy and Peter’s Bike Repair Services. Our immediate neighbourhood is enriched with a tapestry of social activities including an organic garden managed by Camphill Callan. 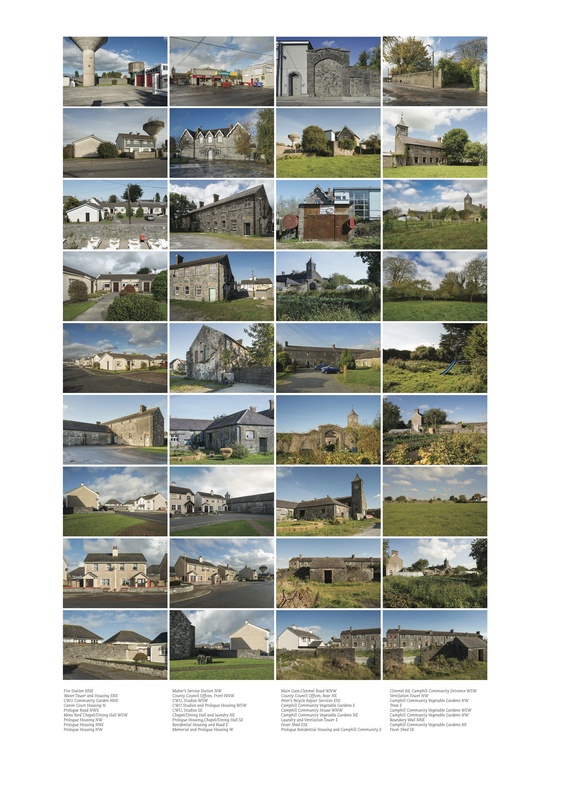 The town of Callan in Co. Kilkenny has established itself as a hub for artistic activity with a network of organisations and collectives including KCAT Arts Centre, Equinox Theatre Company, Abhainn Rí Festival, Fennelly’s of Callan, Monkeyshine Theatre, Asylum Productions, Tony O’Malley Residency and Trasna Productions. Callan Workhouse has a significant history in our town and first opened in 1842 as part of a monumental social engineering project across Ireland and Britain under the Poor Law Union Act of 1838. The top-down approach enclosed and excluded the most vulnerable in society in a formidable institution which compounded inequality and systematic stigmatisation. That this law and the attitudes which made it policy, have continued echoes in social policy and public attitudes in Ireland and Europe today lends the workhouse as a site of contemporary critical urgency. Since the Workhouse was closed in 1921 following Irish Independence, the history of the building has been layered with new uses and stories and is currently a site of civic and residential use. The current 6-acre site includes the fire-station, County Council area offices, housing, cultural spaces and horticulture. Workhouse Union works closely with Camphill Callan to bring public access and awareness to this emblematic building and its history. There is great interest in the significance of the Workhouse, both locally and beyond. Over the past fifteen years many stakeholders and voices have been involved in a creative and collaborative process of planning for the future of the building and six-acre enclosure including – Callan Heritage Society, the Heritage Council, Kilkenny County Council, Endangered Studios, Abhainn Rí Festival, UCD School of Architecture, our neighbours in Prologue and many others. The two most significant public engagement projects to date have been Asylum Theatre’s site-specific theatre work ‘Six By Sundown’ by Asylum Theatre in 2008 and Workhouse Assembly, a 12-day active research workshop in 2013 led by the Workhouse Union team.